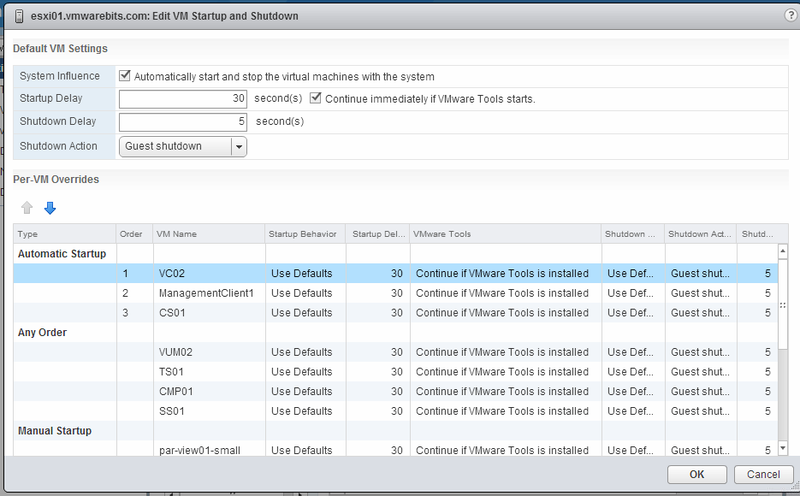 With a default configuration of ESXi no virtual machines will be started when you start your host. In a cluster this also is not most likely necessary because you would migrate virtual machines to another host before you shutdown your ESXi-host. And of course in that case there are no virtual machines to start. But when you do not have a cluster and/or virtual machines are located on your server's local hard disk then it might be useful to start some virtual machines automatically when your server starts. And with the same configuration you can configure that virtual machines should be gracefully shutdown when you power off your host. 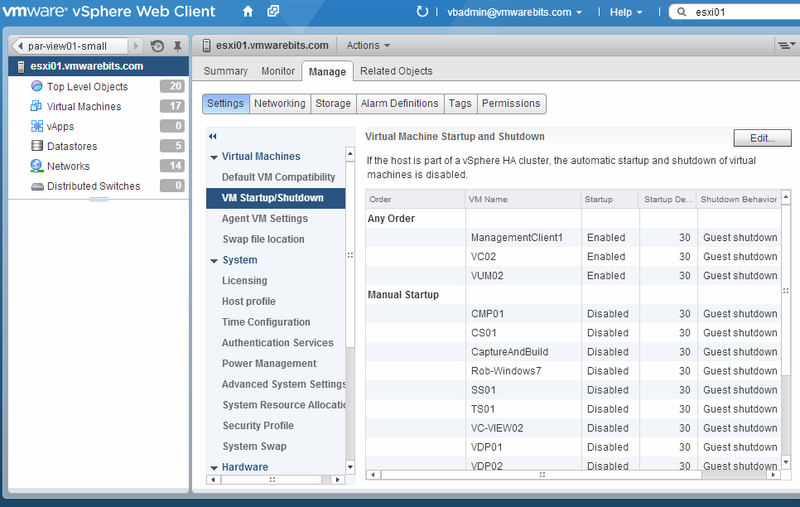 In the image below you can see where to find this setting in the vSphere Web Client for your host. If you only have a stand-alone host without vCenter and the Web Client then you will find this under the configuration tab in the vSphere Client. When you click the Edit-button you can configure the default settings and the individual machine settings. And also move virtual machines from the manual startup category to the Automatic Startup or Any Order list. Tip: In a HA cluster this setting cannot be configured. If you do not have a cluster but do have vMotion and manually migrate virtual machines from one host to another host this automatic startup setting moves with the virtual machine to the destination host. The only thing to note is that if it was in the Automatic Startup list in a specific order it will be added to the Any Order list on the destination host.